AIA worked with John Young, professor of political science and dean of students, to put the panel together. “I was very pleased with AIA when they approached me about this panel,” he said during his opening remarks. “Although we’ve become more event-oriented, we feel it’s also our job as AIA to try to have more academic discussions of real world issues,” junior Vivian Overholt, vice president of AIA, said. 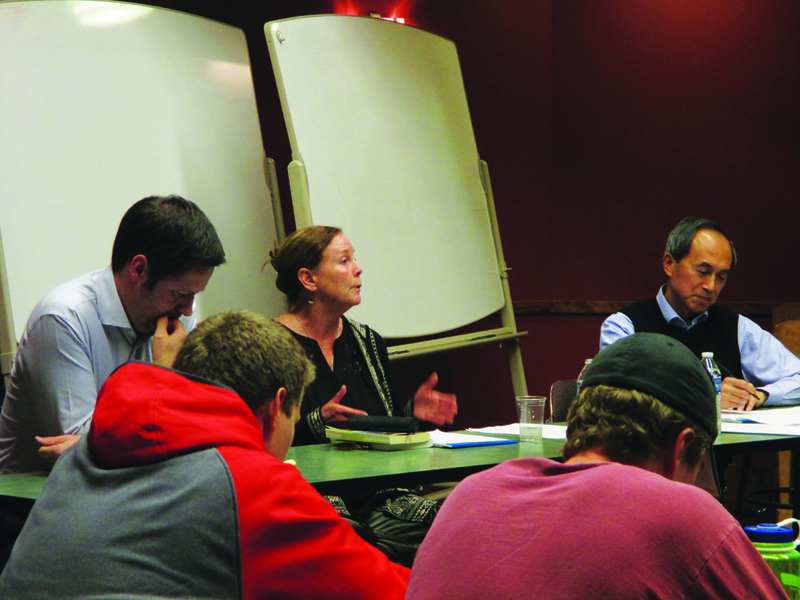 From underlying factors to statistical upshots, the panel, comprised of Bin Yu and James Allan, professors of political science, and Christine McIntyre, professor of languages, unpacked the immigration issue occurring both in Europe and at the southern border of the U.S. The influx of refugees into the E.U. and the U.S. commitment to accept some refugees has, especially since the Paris attacks, resulted in an eruption of political discourse on the issue within and beyond U.S. borders. “The immigration issue has given a lot of fodder to right-wing political parties,” McIntyre said, comparing the association of Syrian refugees with terrorism to that of GOP candidate Donald Trump’s association of Latinos with crime. In response to a student’s question about redirecting political discourse “that resembles reality TV,” Yu said Islamophobia, xenophobia and the use “fantasy and fear” in the mainstream discourse is dangerous for democracy. “ISIS is already here. They’re not all Syrians — ISIS are Americans, they’re French, they’re British. So we shouldn’t be concerned only when it relates to Syria,” Sheree Henlon, professor of Spanish, said from the audience. But for those who were concerned, Allan said the immigration process is fairly extensive in its security measures. A key part in the discussion was recognizing the role of policy, even U.S. policy, in the immigration crisis. In the context of Latin America,“The height of the Mexican immigration to the United States, between the 1990s and perhaps 2010, was actually motivated by U.S. policies — NAFTA, the North American Free Trade Agreement, pushed small Mexican peasant farmers off their land,” McIntyre said. She also noted the similarities of people fleeing abject poverty and violence in Central America, specifically in Guatemala, Honduras and El Salvador, although these people are not considered refugees. With all this talk of refugee placement, one might forget that displacement is not usually a refugee’s first choice. “Most people would never choose to leave their own home,” McIntyre said. In fact, the road to new lands is paved with hardship; 20 percent of people are kidnapped on their way to the southern border and 60 percent are raped; people drown in irrigation systems and suffocate in the backs of trucks. McIntyre also said 300-500 people die on the southern border every year. Likewise, pictures of the hardships of Syrian, Afghani and Iraqi refugees have been released. Yet, they still flee. AIA execs said they hope to host more panels in the future.